Visitors to the Friendicoes shelter come with a variety of expectations. Everyone wants to help in different ways – by adopting or fostering a dog or a puppy, by walking or playing with the permanent dogs and cats, or by donating in cash or in kind. It was the same for Team Hyatt – but they also managed to do something extra! The folks at Hyatt Regency Delhi believe in kindness towards animals. They wanted this Diwali to be special for the animals – sound-free, clean and green. So their visit to the Friendicoes shelter was an attempt to understand the problem better – learning about the terror created by the cracker sounds for animals and how they end up running away from their homes, forever separated from families. Or how unhealthy the smoke is for all living beings. And how some people actually perpetrate wanton cruelty towards animals during the festival. The team was thoughtful enough to make sure it was a special day for the dogs, cats, and monkeys living at the shelter. The dogs got their favourite winter treat – milk, while the monkeys enjoyed dozens of bananas. They also helped us take the dogs on their daily walks, and made sure the puppies got lots of cuddles. Cuddling puppies during work hours is a welcome respite for any office-goer, we believe. A win-win situation for all sides involved! 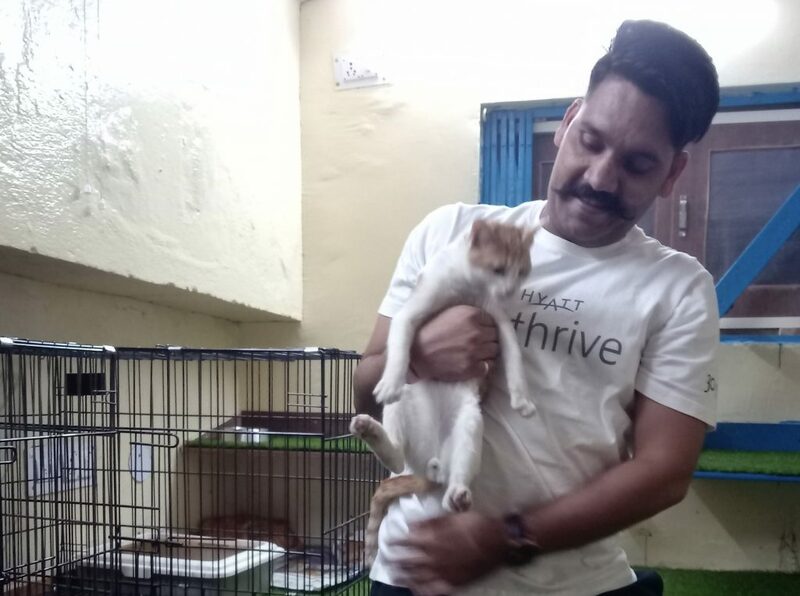 The plight of abandoned pets struck a deep chord with Team Hyatt. “It is disheartening to see so many pets being left behind because their “families” refuse to keep them,“ said Tanima Samaddar. Many were surprised to see “foreign breeds” also living at the shelter. The Hyatt team understood that one of the best things one can do for the animals who are left behind by their owners is spending time and sharing love with them. Watching the sick animals suffer, scared and somewhat helpless was also tough for the visitors, some of whom could relate because of pets back at home. They were able to fully appreciate the hard work the Friendicoes staff has to put in. So in the end, they went away with the resolve of spreading the message of #adoptdontshop on a personal level, while the company started using the #saynotosound hashtag.